The Chinese Culture Translation and Studies Support Network (CCTSS) of Beijing Language and Culture University (BLCU), together with School of Asian and African Studies of Beijing Foreign Studies University (BFSU) held a seminar on Dec. 15 in Beijing on "Translation and Communication of Chinese Culture in Asian and African Countries," which included establishing the CCTSS-Asian, African Language Committee. The seminar was organized to enhance cultural exchange between China and Asian and African countries, and to summarize and address challenges in the process of cultural translation and communication between the two sides. Huang Zhuoyue, director of the Chinese Culture Translation and Communication Research Center, said in his opening speech that BFSU's School of Asian and African Studies ranks top in China's Asian and African studies, while the research center itself is one of the important platforms for cultural exchange between China and foreign countries. He expects their cooperation to effectively strengthen the link between China and nations of Asia and Africa, while fostering the active development of research, translation and communication. Ge Dongdong, associate dean of the School of Asian and African Studies at BFSU, emphasized in her opening speech the important role cultural exchange plays in international diplomacy. "In terms of developing relations with other countries, a country needs not only the ‘hard' support of economic and trade cooperation, but also the ‘soft' support of cultural exchanges," Ge said, adding, "Cultural translation and communication are essential for cultural exchange. The cultivation of talent and deepening of research are also vital to the effectiveness of cultural exchanges." Ge echoed that the setup of the CCTSS-Asian, African Language Committee will successfully promote the translation and communication of Chinese culture in Asian and African countries. Xue Qingguo, professor of Arab studies at Beijing Foreign Studies University, talked in his keynote speech about the importance of quality control during translation of Chinese and Arab books. Xue stated that since reform and opening up, China International Publishing Group and other institutions have translated a number of Chinese works into Arabic language with the help of Arab experts. These books have played an active role in improving popular understand of Chinese people in Arab countries. The number of Chinese works being translated into Arabic has risen rapidly in recent years, he noted, but some translations are of poor quality, which has a negative impact. Xue said he hoped an evaluation and supervision mechanism could be established in an effort to eliminate poor or fraudulent translations. About 10 other experts in the field also spoke at the seminar, including historian Rapport Yoav; Ehizuelen Michael Mitchell Omoruyi, executive director of Nigerian Studies at the Center for African Studies, Zhejiang Normal University; David Rapp, reporter for Israel's Ha'aretz; and additional specialists from School of Asian and African Studies of BFSU. 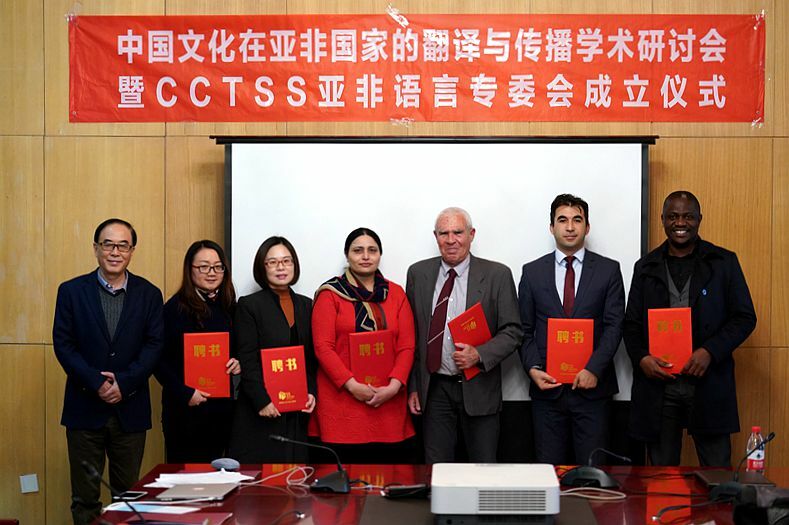 With the aim of promoting cultural translation and communication between China and Asian, African countries, the CCTSS-Asian, African Language Committee was established in Beijing on Dec. 15.